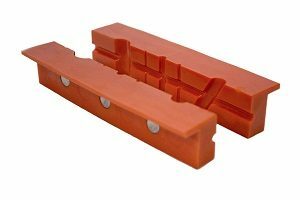 Click here to see examples of bench vise jaw covers. When using a bench vise, there are a couple very common problems that users run into. The first and most common complaint is that the hardened steel jaws on the vise easily damage the work piece. The second most common complaint is that the geometry of the vise jaws doesn’t allow the user to securely hold odd shaped parts, such as those that are round or have complex or non-parallel faces. Fortunately, bench vise jaw covers can easily remedy both issues. Bench vise jaw covers, also called soft jaws, jaw pads, or jaw caps, are covers that you can slide over the jaws of your bench vise. Sometimes they have bolt holes and you can bolt them on top of your jaws (in this case they would have to be specifically made for your vise), or they are available as just free standing covers that you slide on and off at your leisure. The best vise jaw covers for you are going to depend entirely on your application. When gripping a work piece in a bench vise, the usual steel jaws are typically sufficient for most projects. However, when you are working with particularly fragile, brittle or soft parts such as glass and carbon fiber, it can pay to have the appropriate jaws in place. As a rule of thumb, you’ll typically want your jaw cover material to be softer than your work piece. The most common materials for protecting your parts from scratches, chips, or dings are plastic jaw covers and copper jaw covers. You will also see foam jaw covers as well as rubber coated jaw covers from time to time. These materials are chosen because they are significantly softer than aluminum and steel. The tradeoff is that these covers are less robust than your steel jaws and as such have limited life span and require occasional replacement. Oddly shaped parts can slip around quite easily when relying on the parallel faces of your steel vise jaws to hold them steady. Fortunately, there are tons of jaw cover options with V-grooves and holes cut in them to allow you to grip rounded parts. Using covers with these features enables you to position the part you are working on in such a way that it won’t slide around, making your work more precise and safer. The most common materials for covers with these features tend to be aluminum and plastic. The aluminum jaw covers tend to last a little longer, but usually are a little more expensive than their plastic counterparts. While they make up a subset of the jaw covers types that we have discussed previously, we thought it worthwhile to mention magnetic jaw covers since they offer some pretty nice perks. The biggest benefit to magnetic jaw covers is that they stick to your vise, so if you have a complicated piece you are trying to position, the jaw covers won’t slip around. Similarly, if you need a small part to stay in place and need to leave the jaws of your vise open while positioning, the part will stick to the jaw covers. For these reasons, magnetic covers can be extremely nice to have and are often worth the extra coin depending on your intended use. We hope that this information about bench vise jaw covers has been useful. When it comes to protecting your work pieces, no better option exists than using a good set of jaw covers. Click here to see bench vise jaw cover options available on the market!